David Smalley with his 1979 sculpture Warlock III. Photo: Sean D. Elliot, The Day. 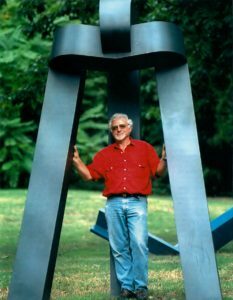 Artist and New London native David Smalley, who passed away in 2015, pioneered the use of computer technology as a tool for creating sculpture, and founded the Center for Arts and Technology at Connecticut College, where he taught studio art for more than three decades. Made of steel, aluminum, bronze and wood, Smalley’s sculptures incorporate a range of styles, and have been featured in more than 50 solo shows in the United States, England and Japan. Smalley typically worked in series, and the show is organized accordingly: kinetic works in stainless steel, which reflect and engage their environment; bent wood pieces, also kinetic, which reference more natural materials and contexts; experiments in 3D printing that produce dystopic industrial landscapes enclosed in bell jars; a somber series of bronze shipwrecks; and finally a mesmerizing “Spartina” series, inspired by the graceful movements of wetland grasses. The outdoor component of our summer David Smalley memorial exhibition will remain on view through October 29th, giving visitors the opportunity to engage with eleven of Smalley’s large-scale sculptures sited on the museum’s beautiful grounds, and with twelve works installed on the Campus of Connecticut College. The Museum has collaborated with professors and students at the College to create a Smalley Sculpture Trail, a web-based tour beginning on the steps of the Museum and culminating at the top of the College Green, with informative commentaries along the way. You can download the free self-guided sculpture trail tour from Camel Tours with this link http://cameltours.org/ct/u20/t41/.